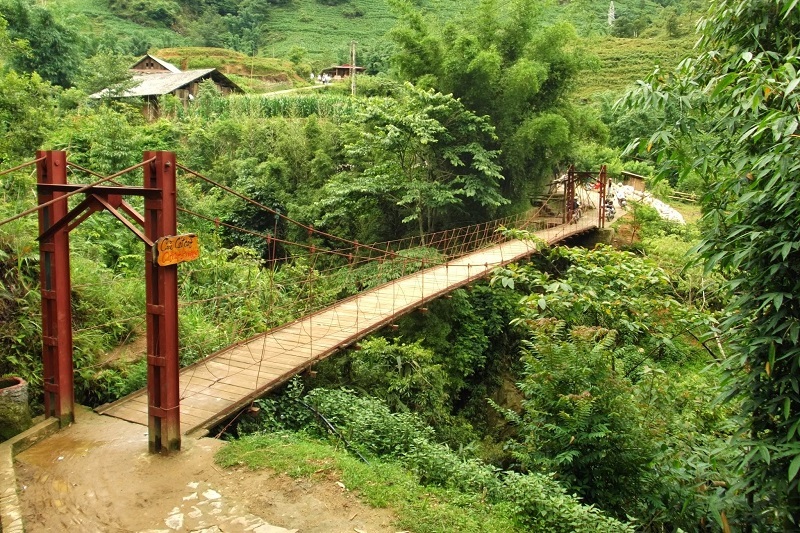 Sapa attracts tourists not only by the naturally breathtaking landscapes but also the traditional cultural features. 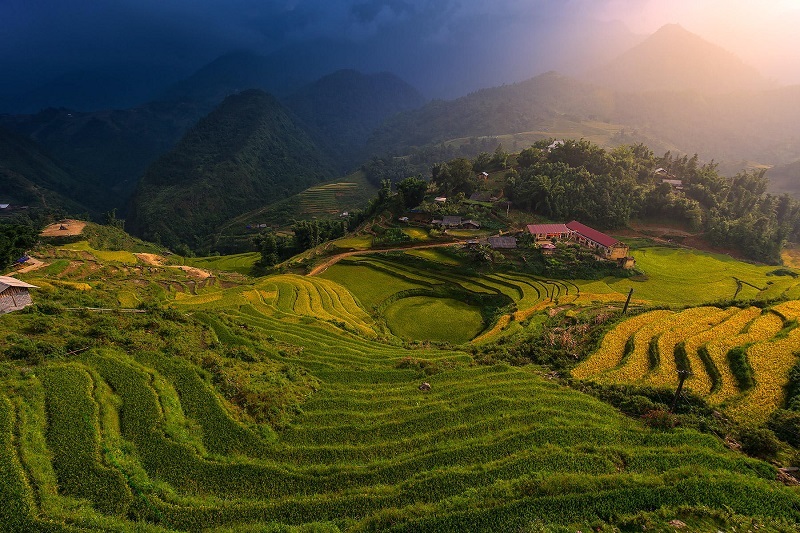 One of the most ideal destinations in Sapa is Cat Cat – the old village of the ethnic groups – attracts tourists from all over the world for its distinctive customs and practices. 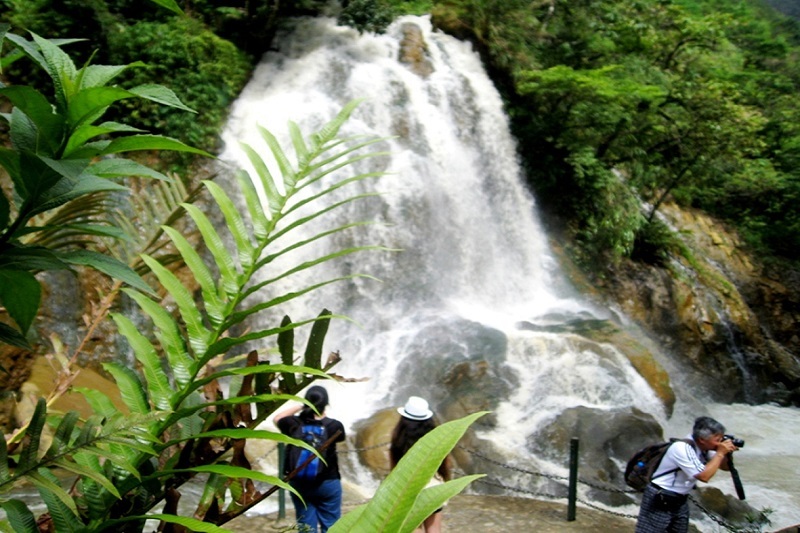 The following are some interesting information which is very useful for you if you intend to visit Cat Cat village in your trip. Cat Cat village was founded since the 19th century and nestled in a beautiful valley about three kilometers from Sapa town. 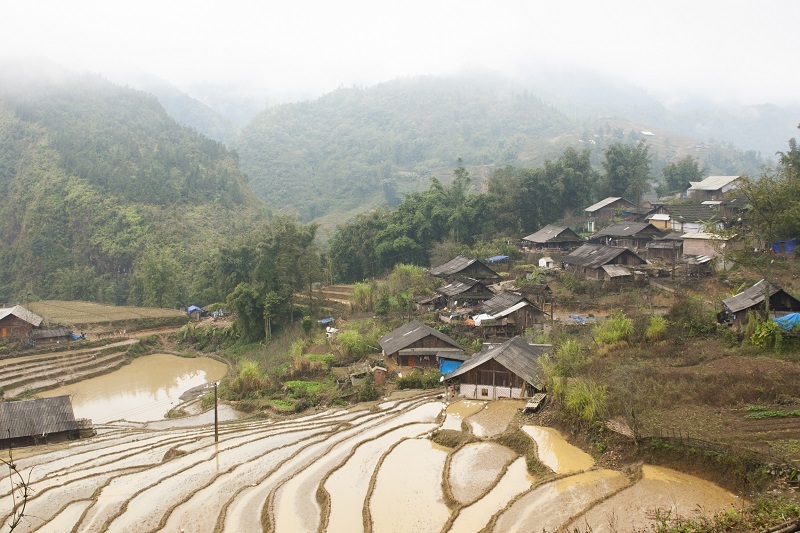 It is famous for the H’Mong ethnic minority who has the rich cultural tradition. The H’Mong ethnic people, especially the Black H’Mong lived along the mountain side and cultivated surrounding their home. 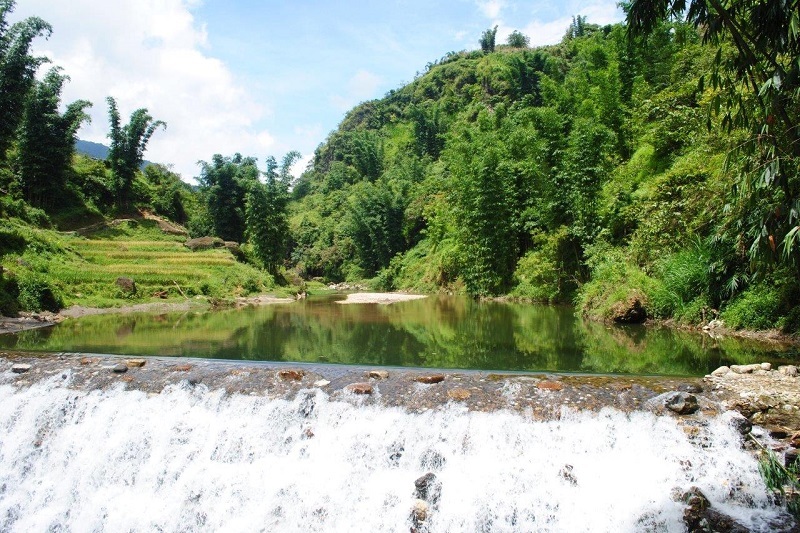 They grow rice on terrace fields and corn on the mountains according to the handicraft cultivation method. The houses of the H’Mong ethnics were built by the special architecture. These houses contain three rooms with three doors, one in the middle and two other on either side. The main door always closed except on special occasions: New – year days, wedding, funeral,… The roof is made of pomu wood which insects do not attack and isn’t deteriorated when in contact with water. If the roof is made of pomu, it will last up to 70 years. However the walls’ material is sawn timber. In addition, there are other indispensable parts of the house such as altar, kitchen and places for sleeping. The costumes are an important part in the culture of the H’Mong. Although the life has changed a lot, the traditional costumes are still preserved here. 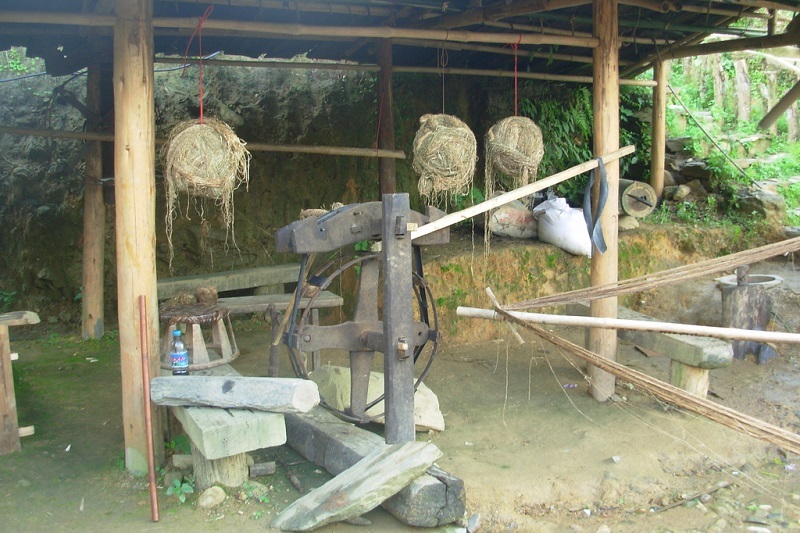 The H’Mong is very famous for making cloth from hemp and dying it a deep indigo blue. The women wear long blouses which are decorated with batik flowers over short trousers. They wrap long scarves around their legs. More interestingly, they wrap their long hair around their head and wear a blue turban. The Mong men often wear long jackets with shirts, a long waist coat which is embroidered at the collar and a small hat. The H’Mong in Cat Cat grow rice and corn on terrace fields and make traditional crafts such as weaving, cotton growing and making jewelries. The H’Mong women take on making clothes for the whole family. Hemp fabric is a necessary part of H’Mong clothing and doing hemp and weaving is daily work of the H’Mong people. They grow and harvest hemp then they separate the bark and dry up. The H’Mong weaves with two types of fabric which is 30cm or 45cm. After weaving they use smooth cane to beat fabric regularly and smoothly and then they make flax expand and fill spaces by putting it into boiled water. After that, they put it under sunlight, this work is necessary because it is done three times. Fabrics are soaked into barrels of sour tamarind leaves for 2 days to maintain the durability of indigo color. Finally, they dry it in the sun then washing with water and cutting it for sewing clothes. They embroider beautiful patterns of flower and animal on brocades. Visiting Cat Cat, you can easily catch sight of women sitting in front of the loom with colorful pieces of brocade decorated with design of flowers and birds. In addition to the brocade weaving craft, the H’Mong in Cat Cat are good at manipulating gold and silver jewelry. They keep a great deal of their family wealth in the form of silver jewelry. All of the H’Mong wear silver neck rings, at least on special occasions because to the H’Mong, silver symbolizes not just wealth but the essence of a good life. Visiting Cat Cat, tourists are most attracted by the unique customs, including the custom of marriage which is well known for the name “pulling wife”. The boys and girls go to the love market where they eat and sing songs together. When a boy falls in love with a girl, he prepares a big party and invites his friends to enjoy while planning to pull home his girl and locks her in 3 days. If the girl agrees to be his wife, then marriage is declared officially. The boy must give the bride’s family silver coins, pigs, chicken and rice wine for the wedding ceremony. If the boy doesn’t have a dowry to give the girl’s family, he lives in her house until he is able to marry her. If the girl refuses the boy, they together drink a bowl of rice whisky and things remain as they were. To the Mong in Cat Cat, the ritual funeral is custom to show traditional, drinking water, remember its source. If there is a death in the family, the deceased’s children will fire a gun to let everyone in the area know. All of people in the village will come to the deceased’s house and bring anything they have – chicken, rice, pig, or rice wine to help that family. Everyone sings and eats together. After that a group of people will wrap the deceased in a mat and carry to a grave while a coffin is carried by another. Both groups have to run very fast to meet at the grave to make the deceased forget the way home. The funeral usually lasts 3 – 4 days. 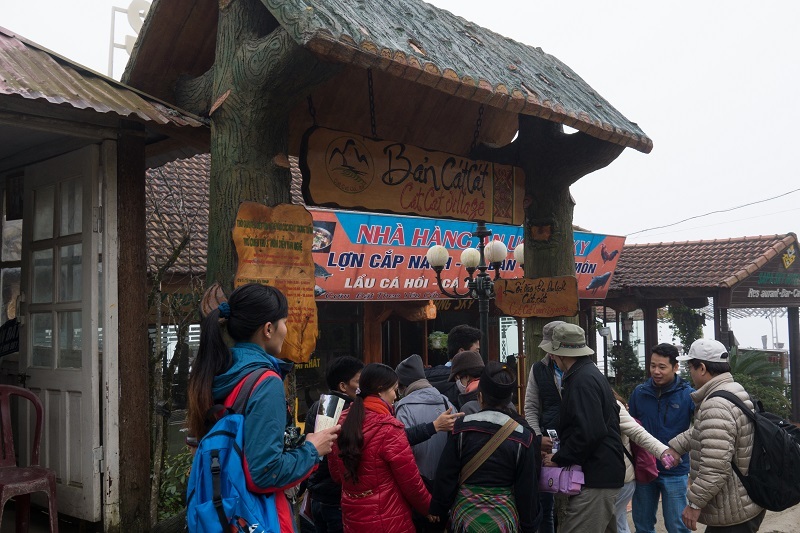 Coming to Sapa in spring, visitors will be overwhelmed in many the interesting festivals, including “Gau Tao” festival. This is an important festival of the Mong to ask for well- being, happiness, longevity and lucky children. Gau Tao festival is organized in 3 consecutive years and each lasts 3 – 5 days. If it’s for one only year, it will lasts 10 – 12 days. The families will prepare worship offerings: pork, square cake, round cake, rice, alcohol, rice paper and the shaman is ready for worshipping. The young girls and boy dress in new and colorful costumes, necklaces and bracelets and sing songs. They also blow bamboo flute, leaf- flutes and play games such as spinning and sticking. Nowadays, Gau Tao has become the village and community festival with age – old customs which has attracted more and more visitors to the region.